n March 21, 1950, bandleader Stan Kenton, touring with his Innovations in Modern Music, was playing a jazz club in downtown Dayton, Ohio, when someone told him there was a terrific vocal quartet playing across town in the Esquire Lounge. After Kenton finished his show, he went over to the Esquire to see what all the fuss was about. Kenton was impressed. The guys harmonized beautifully and sang complicated five-note jazz chords with four voices. As a major Capitol artist and stockholder in the company, Kenton had considerable clout. He called a producer at Capitol and arranged an audition for the group in New York City. Pete Rugolo, Kenton’s former arranger, produced the session at which the quartet recorded five tunes—“Laura,” “Basin Street Blues,” “Dry Bones,” and two others. Capitol president Glenn Wallichs liked what he heard and gave Kenton the green light to invite the band to Los Angeles. Kenton arranged for a one week engagement at Jerry Wald’s on Sunset Boulevard. When public demand stretched one week into eight, Capitol knew they were onto something and offered them a recording contract. On October 13, 1950, they recorded their first single “Mr. B’s Blues” (b/w “Then I’ll Be Happy,” Capitol 1293) released that November. 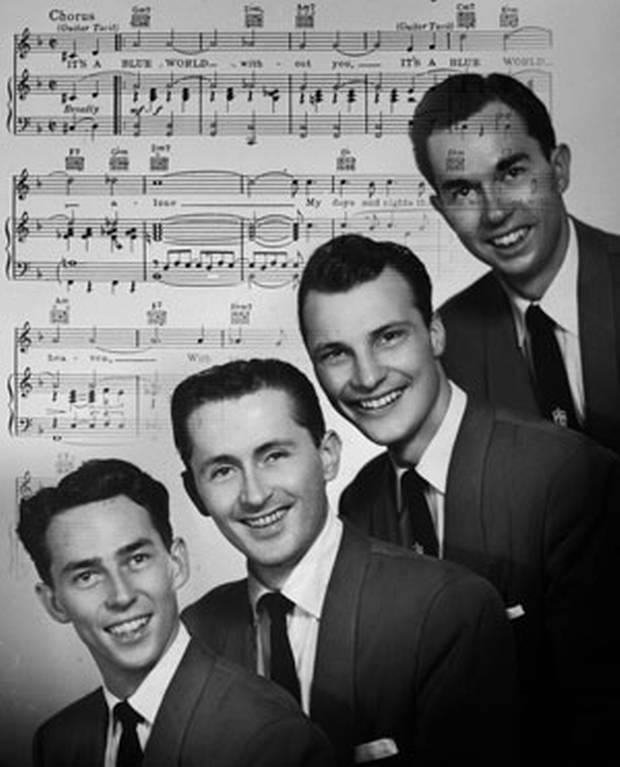 The Four Freshmen were Don Barbour, second tenor and guitar, his younger brother, Ross, baritone, trumpet, piano, and drums, Bob Flanigan, their cousin, lead tenor and trombone, and their friend Hal Kratsch who sang and played bass, trumpet, and mellophone. They met during their first year at the Arthur Jordan Conservatory of Music at Butler University in Indianapolis. Although they were all freshmen at Butler, they were not all the same age because a few of them had already served in the military. “We were in college together, studying to be music teachers, and that’s where we started singing together. We envisioned ourselves just singing in college, having a good time doing it, and then we decided we had something worthwhile and decided to go on the road.” They first called themselves Hal’s Harmonizers and later the Toppers. Flanigan continued, “We started off singing a cappella, but all of us also played instruments, so on the road we started playing as well as singing. We copied things Mel Torme did with his Mel-Tones, and Artie Shaw, and Stan Kenton. We were only going to go on the road for a year, and then go back to school, but we started doing some business and said, ‘Okay, one more year.’” In Chicago, they signed with agent Bill Shelton who renamed them the Freshmen Four. They soon reversed it to the decidedly more melodic Four Freshmen and continued to play nightclubs. Brian spent hours at the piano playing his favorite Four Freshmen songs by ear. But Brian didn’t listen to records like most kids. He studied them. He analyzed how the component parts comprised the overall sound. He cut his musical teeth de-constructing the complex jazz harmonies of the Four Freshmen. He spent years—from age thirteen to eighteen—in disciplined self-study with just a stack of records and a piano. It was a rigorous musical education that paralleled, and eventually surpassed, his formal education at Hawthorne High. He got music. He understood it. He saw how the instruments played off one another, how they meshed with the voices, how harmonies were structured and layered. He was fascinated by how a beautiful melody stirred deep emotions in a listener. How did notes and chords conjure the feeling of being in love? Music was pure and non-judgmental. It assuaged whatever teenage problems, fears, or insecurities he felt. Unlike inter-personal relationships which could be difficult to navigate, music never disappointed him. It eventually brought him admiration and love. It made him feel good about himself. It was a gift he would learn to channel to make other people feel good about themselves. Ross Barbour reflected on why he thought Brian was so captivated by the Four Freshmen. “Although I have never had this confirmed, I feel certain that what intrigued Brian about our sound, in addition to the long tones and sustained harmonics, was that we were singing overtones. An overtone is when a note is sung true by one singer and a little bit different, just a little flat or a little sharp, by another singer. The resulting overlap, or overtone, creates an interesting sound that tricks the listener’s ear into hearing a note that is not actually in the chord. Pop vocal groups had not done that before. Don, Bob and I came from a very musical family. My mother’s father, Elias Fodrea, and my grandmother had twelve children—ten girls and two boys. When the family got together, we’d all sing church and folk songs. We’d be scattered throughout three rooms in this brick house, all of us singing the same song. When you heard those overtones, it became habitual, you just wanted to keep hearing them and be surrounded by them. You wanted every chord to have them.” Ross also credited the Freshmen sound to “opening up the chord.” That’s when one of the middle notes of a chord is sung a full octave lower. That stretches the chord and makes it sound fuller and richer. Other writers, however, varied on where and when this concert took place. Brian and Gold mentioned the concert and meeting, but made no mention of the venue or date. Badman placed the event at the Coconut (sic) Grove in The Ambassador Hotel in 1954, when Brian was twelve years old. White stated the venue was the Crescendo Ballroom, but did not mention a date. Preiss, Gaines, and Carlin were silent on the subject. The Crescendo was owned by former disc jockey Gene Norman and located at 8572 Sunset Boulevard in Hollywood. Norman presented new and established talent, and recorded many live albums at the Crescendo for his GNP record label which he formed in 1954. The label was also known as Gene Norman Presents or GNP Crescendo. After the show, Murry bluffed his way backstage and escorted Brian into their dressing room so Brian could meet the group. Meeting his musical idols was inspirational for Brian. It helped make him feel less self-conscious about his high singing voice and more determined than ever to find his way through music. Reportedly, he returned home and sang the entire Freshmen concert repertoire in his parent’s living room. Ross Barbour, personal communication, October 2007. Jeff Bleiel, Add Some Music, edited by Don Cunningham and Jeff Bleiel, Tiny Ripple Books, 2000, pages 92-93. Jerry Fink. “Founder Recaps Freshmen Years, Q&A with Bob Flanigan,” Las Vegas Sun, January 3, 2008. David Leaf, The Beach Boys and the California Myth, New York: Grosset & Dunlap, 1978. Melody Maker, December 3, 1966. Ken Sharp, “Christmas with Brian Wilson,” Record Collector, January 2006, page 75. Bill Wagner, interview by author, November 2007. Paul Williams, “Brian Wilson, Fi 1, no. 2, March 1996, page 27. “Brian Wilson: I Guess I Just Wasn’t Made for These Times,” DVD, directed by Don Was, Artisan Home Entertainment, 1995. Thank you for this excellent, well-written article! Please see Brian Wilson’s comment about the Cocoanut Grove at: https://www.laweekly.com/music/brian-and-melinda-wilson-on-unflinching-biopic-love-and-mercy-it-had-to-be-factual-5662997. (Though he puts the date in 1958).